Home of some of the tallest buildings in the world, the United States was the first country to witness the birth of the skyscraper, placing New York and Chicago high in the tops of the cities with the highest constructions for nearly 130 years. Although nowadays the countries in the Eastern hemisphere are dominating the top with Dubai’s impressive 828-metres Burj Khalifa, the United States remain one of the go-to land for admiring and visiting some massive architectural achievements, unique on the entire planet. Built in 1192 and measuring 1,023 feet (312 meters), the 55-story skyscraper is not only world 53rd highest building, but also the most grandious in a state capital and highest built in the USA in the 1990s. It is also popularly known as The Pencil Building or The Cigarette due to its shape. 1,046 feet (319 meters) tall and spread across 52 stories, the 2007 Manhattan skyscraper is the 50th in the world, sharing its record with the Chrysler Building. The oldest edifice in the US top 10, the 1930 impressive construction was the tallest in the world at its inauguration, with a height of 1,046 feet (319 meters) over 77 stories. Now occupying the 50th place in the world, the Art Deco skyscraper situated in the Turtle Bay area was the first construction measuring more than 1,000 feet, and still remains the highest building made of brick. World’s 34th biggest edifice is also the first trussed-tube construction on the planet with the highest residential units. Build in 1969 and with a height of 1,127 feet (344 meters), the 100-story skyscraper was the highest in the world outside New York when it opened, and hosts a restaurant, an observatory and America’s highest indoor swimming pool. The 30th most towering skyscraper was finished in 1973 and measures 83 stories over a height of 1,136 feet (346 meters). Aon Centre is also known around the world for its exterior lighting that matches seasons and holidays, with orange for Thanksgiving or red at Christmas. The impressive Manhattan skyscraper opened its doors in 2009, boasting a height of 1,200 feet (366 meters) and 53 stories. Designed to be efficient and environmentally friendly by preserving heat and maximizing light, the 3rd highest edifice in New York City and the 26th in the world was featured in an episode of National Geographic Channel’s series MegaStructures. The emblematic 1931 construction is not only a cultural icon of its city and country, but also the first skyscraper on the planet to contain over 100 floors, namely 103. Measuring 1,250 feet (381 meters), world’s 22nd most imposing building was the first in terms of height for nearly 40 years, and was included on the list of the Seven Wonders of the Modern World for its impressive architectural style. Initially planned as the highest edifice in the world, the Tower now occupies the 15th place with its 1,389 feet (423 meters) and 92 floors over-viewing the Chicago River and Lake Michigan. Bearing the name of its tycoon owner, the building became famous all over the world when it was chosen as a location for the first season of the popular reality TV show The Apprentice. Also known as Sears Tower, the 1973 skyscraper was the first on the planet for 25 years, thanks to a colossal height of 1,451 feet (442 meters) and 110 floors. It is visited every year by over a million tourists for its beautiful observation deck, called Skydeck, that offers a marvelous view over the American city. USA’s tallest skyscraper is the 4th in the world, although it dominates the entire Western Hemisphere with its 541 meters and 105 floors. 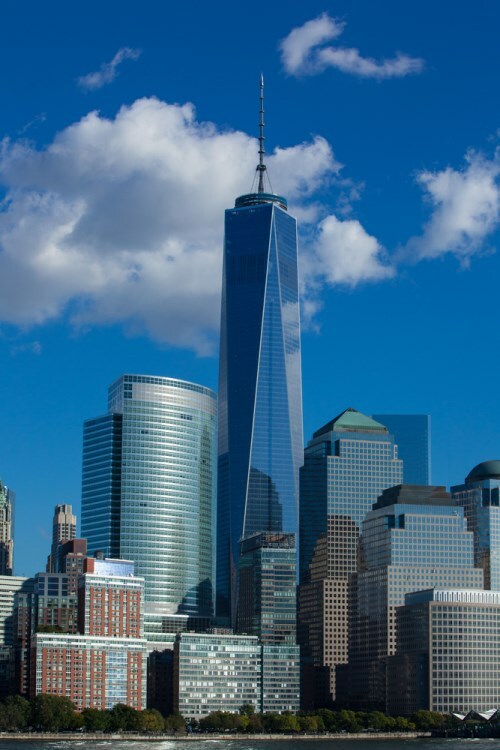 Designed in a contemporary modern style, the edifice was built on the site of the original World Trade Center.